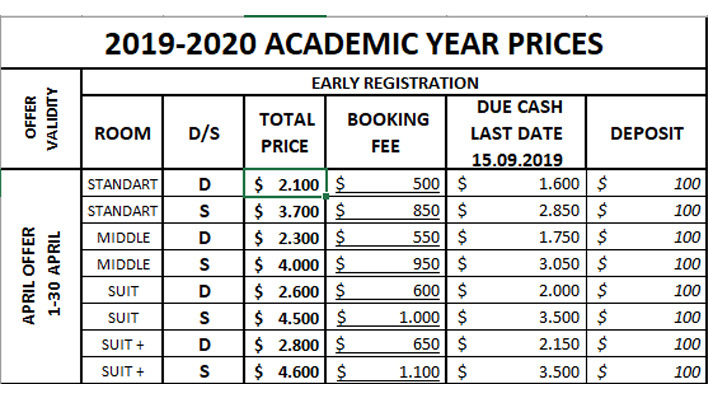 New price lists are prepared for each academic year and semester. Registered students can benefit from discounts. You can also benefit from our campaigns with very attractive prices and payment options in the months of April and May before the new academic year. In order to make your registration, you must deposit the deposit according to the room type (reservation fee) and deposit to the bank account numbers or the dormitory office. The remaining balance should be closed before entering the country. NOTE: The S/D-shaped column shows the amount to be paid if the student stays in the room with a single (S) or roommate (D). NOTE: Persons who will make a deposit in Turkish Lira through the bank account number must call the dormitory office for the daily exchange rate information. NOTE: Students can make their investments in dormitory and deposit fees, bank account numbers in the prices section or from hand to dormitory accounting. The Dormitory Management cannot be held responsible for the fact that the payments made by the student will not appear in the system. For this reason, in order to prevent the possible negativity, students should be sure that the payments they made at certain intervals are processed in their accounts; and they have to check their payments within 5 days from the date they make the payment, otherwise they should apply to the Dormitory Directorate either personally or by e-mail with payment notes. No entry will be made to the room before the entire balance is closed. In case the student fail to fulfil the payment and the obligations on time, shall be required to pay the standard tariff prices and the 10% damage compensation for each month of due. Installment Credit Cards: İş Bank. When logging in; students who pay from the bank will give a copy of the bank receipt, ID card or passport copy, student certificate and passport photo.